04.26.2006 - One of the common complaints that I hear from customers is that raccoons are feeding on pet food left outdoors. Duh! If you leave food outside, animals other than Spot and Fluffy are going to find and eat it. The simple solution, I tell such people, is to take the food indoors, especially overnight, or make sure that the pets eat all of it. If you do take the food indoors, don't leave it adjacent to a pet door or in a screened-in porch. Raccoons will still be able to smell it, and now they will break in to get to it. That's what happened at this job today. 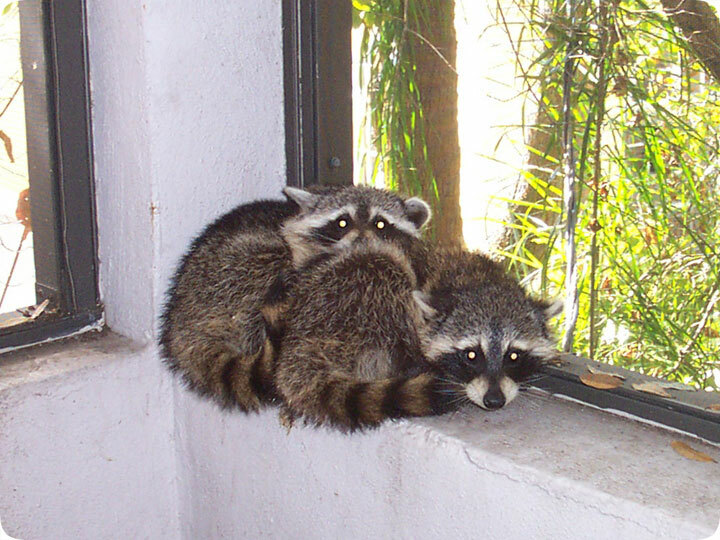 These two young raccoons actually smelled pet food through a ceiling screen, and fell through into the porch, where they got stuck. I was called out to remove the raccoons, and this is the sight I saw. I did remove them with my snare pole, and relocated them outside. The homeowner elected to fix his own porch roof, and not leave out pet food any more. Below are some emails from people who have complained about various pet food thefts from raccoons. Many of these people were out of my service range, but I was able to advise all of them to keep the pet food securely indoors. Hello, I live in Jacksonville, FL and I am having a problem with raccoons coming into my house through my cat door and eating my cats food. I was wondering if you have any recommendations or if the only option is to trap them? Regarding the traps I am worried that my cats will be trapped as well? Please let me know the best solution (other than taking out the cat door). Also, I would like to know the cost of your services for trapping Raccoons. Thanks!